English is an extremely popular study language – it sits at the top of the list of the most studied foreign languages in the world. As a result, there are more than 50 different English certificates on the market today and it would not be possible to list them all here. The aim of this article is not to detail each of them, we will focus on the most prominent certificates and help you make out the differences. Here we are using the word “certificate” liberally. Indeed, you will notice that most of what we call certificates here are standardized tests and do not lead to a diploma. Rest reassured, we will detail the differences between tests and certificates in this article. 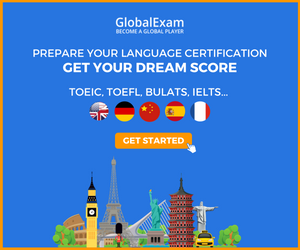 ETS, an American nonprofit organization whose goal is “to help advance quality and equity in education”, manages these two very popular “language certificates”: the TOEFL and the TOEIC. It might be abusive to call them certificates though. Technically they are standardized language tests. That means you cannot fail them and the score is interpreted as your level in the English language. In practice, schools use your score to accept or to refuse students for programs or outgoing mobility. If prospective students do not meet their requirement, they are not going to get admission. The ETS is thus a service provider that give standardized tests that are recognized everywhere. So the tests do not entitle students to a certificate or a diploma. But as those tests have become globally recognized, they have become references and people often write them in their resumes and it’s still relevant even though they are past their validity time. And as such, it is no surprise that people have started calling them certificates abusively. Different tests will test different English. English for studies, English for work, etc. This is why tests will have a limited time of validity, unlike a diploma that you keep for life, like a bachelor in English for instance. The Test of English as a Foreign Language, or TOEFL is a standardized test to assess the ability of non-native speakers wishing to enrol in English-speaking schools or universities to follow courses in English. The Us-based nonprofit organization ETS has been administering the test since 1964, date of its creation. it is considered the most popular English test in the world, along with the IELTS. It is recognized by more than 9,000 higher education institutions around the world. It is present in more than 130 countries. It costs $250 and is considered valid for two years. It lasts four hours and students are assessed in four skills: reading, writing, listening, speaking. The student is recorded and assessed later, unlike the IELTS which places the candidate in front of an examiner. PBT: final scores range from 310 to 677 and does not include written exam score. Since the ETS introduced the TOEFL Internet-based Test in 2005, it has progressively replaced the paper-based Test (PBT) and the computer-based test (CBT). The CBT was discontinued in September 2006 whereas it is still possible to pass paper-based tests in limited areas. Each university or college sets a minimum score for admission into the school or into a program. It is not possible to state a minimum score here as each establishment is free to set a different minimum accepted score. To illustrate this, minimum scores for admission can range as low as 61. On the other hand, a university like Oxford requires a score as high as 111 out of 120 for admission. The TOEIC is the second standardized test here is managed by the US-based ETS. They have been administering it since its creation in 1979 by a Japanese team backed by the Japanese Ministry of Economy. It is a bit different from most other “certificates” here because it is an enterprise-oriented.. As such, it was not originally designed to measure English skills to follow courses in English. It was originally created in 1979. However, some schools accept if for admission, for instance in the United States. When people refer to the TOEIC, they usually refer to the TOEIC listening and reading test. It only assesses your English comprehension skills. The TOEIC gives you a score from 10 to 990 (Basic Proficiency to International Professional Proficiency). 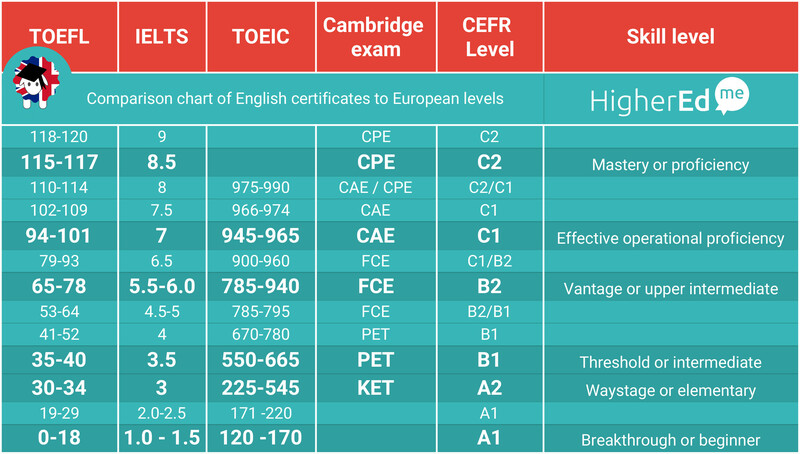 The scale corresponds to CEFR levels A1 to C1, which is fairly lower than the level of the TOEFL and the IELTS. Like those two, it is a test – and not a diploma – so it is not possible to fail it. However, universities and colleges require a minimum level for admission. On top of that, schools will often encourage students to take it for recognition of their proficiency after their studies. But most of the time, some schools require it for graduation. For instance, in France, scoring a TOEIC with 785+ is required to validate an engineer’s degree. Some diplomas require 750+. Complementary to the listening and reading test, students can also take the TOEIC speaking and writing test, which assesses expression skills. This complementary test is graded from 0 to 400. This one is rarely required by businesses or universities so our advice is to only take it if it is specifically required by a school. The writing and speaking tests can be taken separately and are graded from 0 to 200. Of course, the ETS is not alone on the market. The IELTS is the TOEFL’s toughest competitor and there are plenty of other solutions on the market. Every candidate must choose between the General Training module and the Academic module. Students will most likely choose the later as it will give access to higher education in English. The General Training will be of interest for those seeking to gain work experience or for immigration purposes. Those tests procure a qualification. Consequently, they do not have a validity time and do not get obsolete. A diploma means it is possible to fail the examination. Candidates will have a grade from A to E. They will pass if they get a grade between A and C and fail if they get a D or an E. However, all candidates receive a Cambridge Statement of Results with their results and their CEFR level. Each certificate corresponds to a CEFR level: However, if a student gets an average grade it is possible to get the CEFR below the level of the certificate. On the other hand, it is possible to get the level above if he/she does extremely well. The Cambridge is divided into four parts: writing, reading and language use (grammar, vocabulary and collocations), listening and speaking. The speaking is taken face-to-face with two candidates and two assessors. Only one of the assessors ask questions and interacts with the candidates. Their speaking skills are both evaluated in interaction and in a monologue. We hope that all the details we gave you about these certificates and standardized tests helped you understand them better. There are so many parameters to take into account before taking a decision. Do I want a real certificate or a standardized test? What level do I need? TOEIC or IELTS or Cambridge? You can find below a chart of comparison between the different tests based on levels. 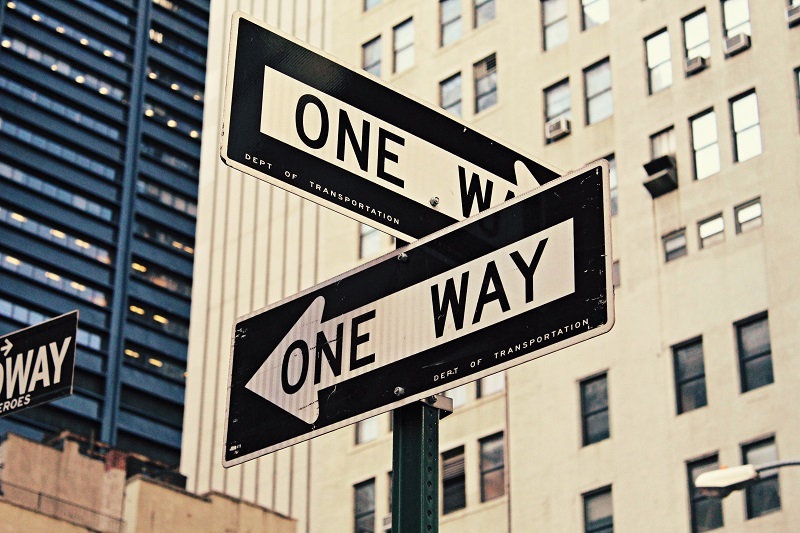 If you had to compare the ETS tests to the Cambridge tests we might add that the Cambridge tests are better suited if a student is planning to join a British school and the ETS ones if going to the US. Although it is not definitive. You can indeed study with a TOEFL in the UK and about everywhere. Conversely, your IELTS or CAE will be recognized about everywhere. In the end, it is just about what certificate or test the school will accept. The Pearson Test of English Academic (PTE academic) by Pearson Language Tests is an Australian test to assess non-native English speakers’ readiness to follow university-level studies. It is recognized in the UK, the US and many other countries like France, Spain, China, Italy Malaysia… in prestigious universities like Harvard, Yale, business schools like London business school, HEC and also a number of art and music schools. Test scores range from 10 to 90, using the GSE (Global Scale of English). ECL English language test by the ECL – European Consortium for the Certificate of Attainment in Modern Languages. The ECL provides a standardised test system customised to the languages of the EU member states. The test system is based on the recommendations of the CEFR. The ECL language exam can be taken on four levels based on CEFR levels: A2 – Waystage, B1 – Threshold, B2 – Vantage, C1 – Effective Operational Proficiency. The exam consists of four parts: oral communication, listening, written communication and reading comprehension. The test does not grammar tests and translation tasks. The exam can be taken in 15 languages. Other European test systems are available in multiple languages like the TELC managed by a German organisation and the DCL run by the French Ministry of National Education Let’s mention the GMAT or Graduate Management Admission Test before we finish. It is a test in the English language partially managed by Pearson that can but the test assesses more than just English proficiency. Indeed it measures several skills considered essential for students who pursuing admission in a graduate management program, such as an MBA so it assesses certain analytical, writing, quantitative, verbal, and reading skills in written English for that purpose. We have included this one to be complete but this one is borderline. It is a language test but not entirely a language test. HigherEdMe collects many studies abroad intentions and connects international student candidates with schools and universities. Certificates are really important in this process because it gives recruiters the guarantee that enrolled students will be able to understand the language used for the local training provided. If you want to help your students prepare a language certificate, HigherEdMe has partnered with Global Exam. You can use HIGHEREDME as a discount code to get 20%OFF. To get a more powerful agreement, feel free to contact us.